Trapped beneath the surface of Abraham Lake are thousands of bubbles frozen in place that create a magnificent display for visitors to discover. The lake is becoming increasingly popular with photographers as word of its magic spreads across the Internet, yet it remains a hidden gem in the Canadian Rockies. The location of Abraham Lake explains both its 'magic' and its relative obscurity. Located roughly 200km west of Red Deer in Central Alberta, it is situated along a stretch of highway known as the David Thompson Corridor and runs from the old coal mining town of Nordegg to the Icefields Parkway. Although this corridor provides direct access to one of Alberta's biggest tourism draws, it is only used by visitors from major city centres that intentionally take the scenic route. 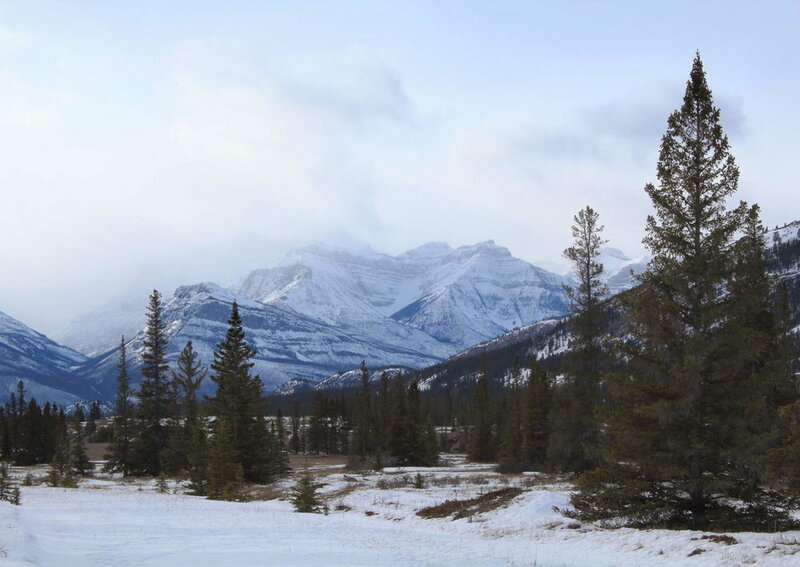 This region is also one of the few mountain areas in Alberta outside of a National, Provincial or Wilderness park and sees far fewer tourists for this reason. In close proximity to the Columbia Icefields, it has all the striking beauty of the parkway but nearly one-tenth of the crowd. Abraham Lake is man-made and was created as a result of constructing a hydroelectric dam along the North Saskatchewan River in 1972, covering what was previously a combination of forest and grassland. 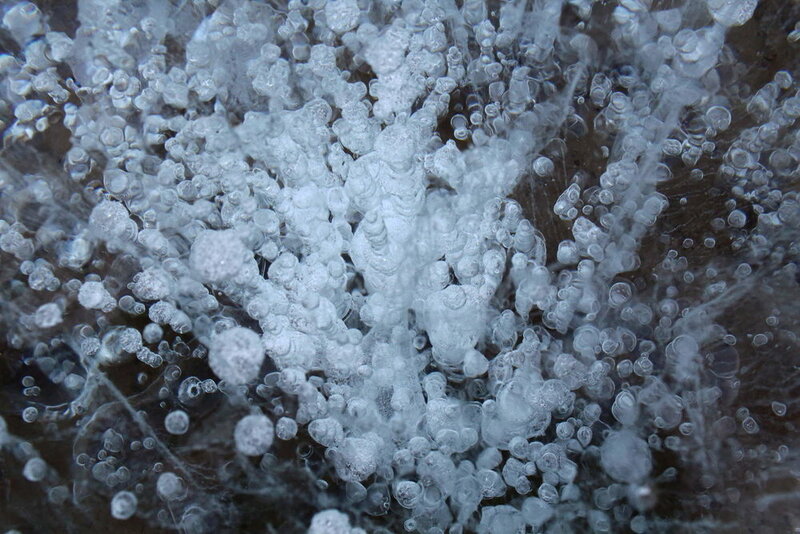 When plant-eating bacteria that reside at the bottom of the lake decompose organic matter, methane gas is released and creates bubbles that soon become frozen in the ice. Due to the shallow water and a windswept surface, these bubbles are visible and often on full display during the coldest months of winter. Due to the long commute, we opted to stay one night in the area and enjoy a full day from sunrise to sunset. We stayed at the Nordegg Hostel, a beautiful log cabin deep in the forest with a great atmosphere aided by its cozy common area, large kitchen and outdoor fire pit. Everyone at the hostel was there to enjoy the outdoors and the room was permeated with warm discussion and advice on gear, hikes and photography locations. Nearly everyone at the hostel was up at 6:00 am and we joined the convoy of vehicles driving through dusk towards Lake Abraham. Sunrise wasn't the dramatic light show we had hoped for but as daylight lit up our surroundings a spectacular frozen landscape appeared. Through the course of the winter, large slabs of broken ice had risen to form miniature mountain ranges and left shallow sections of the bottom exposed. Slightly disappointed by the lacklustre sunrise and apparent absence of bubbles, we opted to explore the David Thompson Corridor, stopping at various viewpoints and returning for a hike to frozen Siffleur Falls. The trail crossed the North Saskatchewan River on a long suspension bridge and followed Siffleur Canyon to three sets of falls (at 4km, 6.5km and 8km). We followed a path along the narrow canyon before admiring the roaring falls beneath what appeared to be a layer of frozen whipped cream (if it was, we definitely would have named this post after it). For the last hour of daylight, we headed back down to the lake and burst with excitement upon finally finding the bubbles that eluded us earlier. As we sprawled on the ice and marvelled at the incredible formations the skies lit up dreamy shades of pink and purple, reflecting on the surface of the lake. As the sun set behind the mountains, temperatures quickly dropped and loud cracks of breaking ice echoed along the valley. By the time we hurried off of the ice and our day at Abraham Lake was complete, we were exhausted, exhilarated and content. The only slight disappointment of the day belonged to Ben - neither of his proposed blog post titles (based on hit songs by Vanilla Ice and Foreigner) were accepted. Disclosure: Precaution should be taken when walking onto the ice. Many people use crampons or ice cleats to prevent slipping or falling. As this lakes lies along the North Saskatchewan River, water moves beneath the surface year-round. The areas we entered on the lake were no more than one to two feet deep and were visibly frozen solid to the ground. If you are unsure of how stable the ice is, it is better to stay safe and stay off. For those using photography equipment, strong wind gusts can knock over tripods so be sure to hang on to your gear.